A sixth consecutive day of declines took European miners to a bear market, and analysts predict more tough times for the sector that has lost more than 20 percent since June. Metals markets have been battered by concerns over an escalation in the U.S.-China trade war. Metals markets have been battered by concerns over an escalation in the U.S.-China trade war. Goldman Sachs analysts said on Tuesday there was room for further losses, even though metals looked oversold. To make matters worse, the fall was accelerated by a sharp drop in steel futures on market speculation that China would review its production curbs, a suggestion that was later denied. The Bloomberg Industrial Metals Subindex fell as much as 1.8 percent, reaching the lowest level since July 2017. Zinc led the decline on Tuesday after speculators cut their net bullish bets to a record low, while copper — which in August experienced its worst month in two years — extended its fall amid concern that an escalating trade war will erode demand. Copper miners KAZ Minerals Plc and Antofagasta Plc are the worst-hit stocks on the sector in the past three months, along with gold and silver miner Fresnillo Plc. Despite being defended by brokers including JPMorgan, which on Monday said mining shares are becoming too cheap to ignore, the Stoxx 600 Basic Resources Index declined 0.8 percent in one of Tuesday’s worst performances on the wider benchmark. 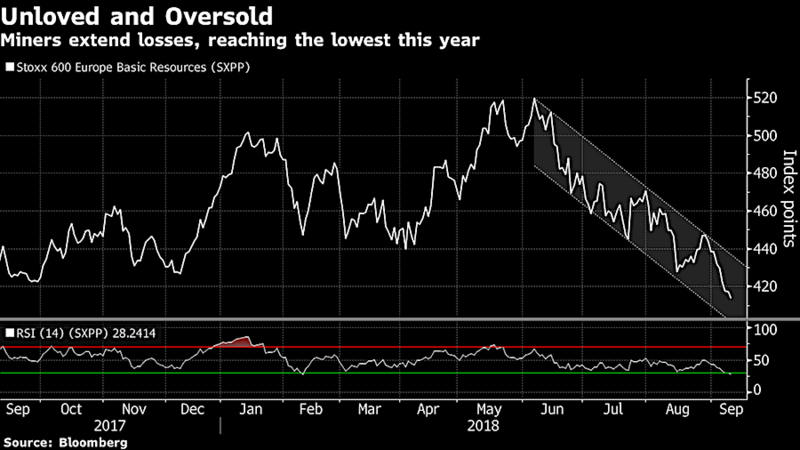 The sector reached oversold territory for the first time since February, and hasn’t been this cheap in more than five years, measured by a 12-month forward price-to-earnings ratio. For investors looking for a contrarian bet, the “sweet spot” for investing in mining equities is not over yet, according to Clarksons Platou analyst Jeremy Sussman. China is roughly halfway through its 5-year economic plan that emphasized growth and reform, which favors the miners, Sussman wrote.